Originally known as The Palace Theatre, The Morris Theater in South Bend, IN has been bringing the hottest acts and the biggest films to Indiana audiences since 1921. 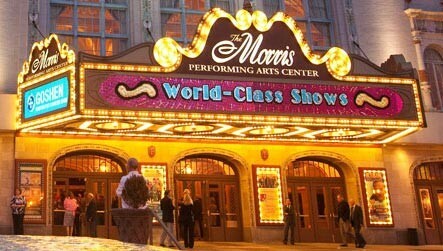 Originally a vaudeville house and currently hosting an average of 90 shows a year, The Morris Theater is on the National Register of Historic Places, has been called Indiana’s Premiere Venue for Live Entertainment, and is consistently listed among the Top 100 Theaters Worldwide by Pollstar Magazine. Acts who’ve graced the stage include but are certainly not limited to: the Ziegfield Follies, Harry Houdini, Elvis Presley, Frank Sinatra, Marvin Gaye, Hank Williams, ZZ Top, George Carlin, Harry Connick Jr., Willie Nelson, and Robin Williams. Only half an hour’s drive from Bremen, we encourage you to make the trip and get a few tickets to a show while you are in town – you wont be disappointed! The present schedule includes two favorites, one a classic Christmas show! The first, playing through December 8th, is Jersey Boys, the Tony® Award-winning Broadway blockbuster musical about Rock and Roll Hall of Famers Frankie Valli and The Four Seasons who wrote their own songs, invented their own sounds, and sold 175 million records worldwide … all before they were 30! Following Jersey Boys, on December 14th and 15th, is the timeless holiday classic, The Nutcracker Suite. Presented by the Southold Dance Theater, this version of the beautiful Christmas ballet features world renowned Victoria Jaiani and Temur Suluashvili, the Joffrey Ballet Principal Dancers, and an outstanding cast of more than 150 performers. You’ve not seen a Nutcracker Suite like this before. Using Scottish Bed and Breakfast in Bremen as your base of operations is a great choice. Not only do we offer luxurious lodging in the Amish Country of Northern Indiana and scrumptious, homemade breakfasts but our location offers a quiet retreat after a day of activity that you’ll be happy to be able to come home to. We have a special on now through March, 2014 and our gift certificates make great gifts, too! This entry was posted on Wednesday, November 27th, 2013 at 10:00 am and is filed under Things to Do Near Bremen, Indiana. You can follow any responses to this entry through the RSS 2.0 feed. Both comments and pings are currently closed.